Tour guides and others who come in contact with tourists supplement their income by selling painted maps. This example depicts the route between Iquitos and Leticia (a distance about 325 miles) taken by tourist river boats. 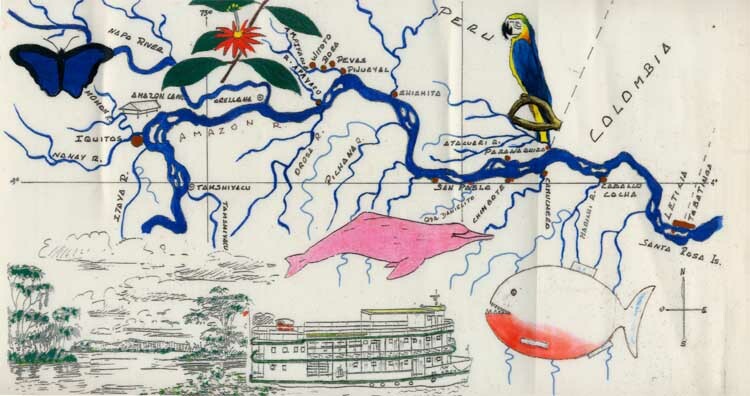 Besides rivers, towns and national boundaries, the map shows some of the wildlife commonly encountered during the journey as well as the vessel itself (See tourist river boat). This map was painted by Daniel Rios, a guide who worked for many years on the river boat El Arca.